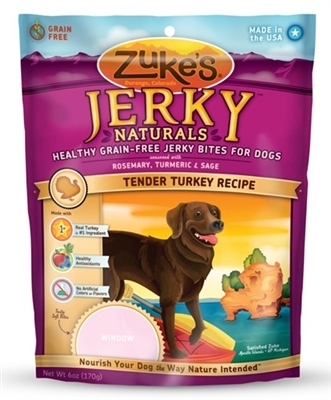 Finally, a yummy treat that is actually good for your dog. Jerky Naturals are the healthy alternative to dull, dry biscuits and artificial snacks made from by-products and junk. These everyday, anytime treats are made with real meat, apples, carrots, barley, molasses, canola oil, garlic and flax seed, plus vitamins and minerals for overall good health. Ingredients: Turkey, Potatoes, Tapioca, Vegetable Glycerin, Gelatin, Maple Syrup, Molasses, Carrots, Apples, Blueberries, Sunflower Oil, Salt, Lecithin, Phosphoric Acid, Sorbic Acid (a preservative), Rosemary, Turmeric, Sage, Citric Acid, Mixed Tocopherols.